President Obama delivered his second State of the Union address last Tuesday. While the speech was interesting for its political implications, I was drawn to the use of a variety of digital tools and social media services. 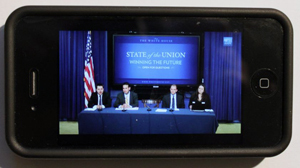 The White House extended the occasion of a single televised speech with a series of follow-up events aimed at connecting the president and other members of the administration directly with the American people. The outreach wasn’t just digital and social but a combination of online and off-line engagement. Many of the online events were held in a room with a live audience. The day after the speech, President Obama went on the road to visit wind and solar energy companies to demonstrate his commitment to clean energy. And the White House team catered to the usual press needs and delivered on other traditional tactics. It was a whole week of diverse communications activities surrounding and supporting the actual speech. But as part of an integrated communications approach, the team followed its desired youth audience to the online places they are familiar with and use every day. It combined a number of online ideas and internal experts to bring “people a little closer to decisions that get made in Washington” as Press Secretary Robert Gibbs put it. Was it successful? Other than the numbers provided as part of the presidential YouTube interview, I have not seen any stats. The increasing digital and social media integration seems to reflect the American government’s desire to find more ways of communicating directly to citizens while decreasing the reliance on traditional interpretive filters of journalists and pundits. As much as it is true that social media success is fueled by the willingness of organizations to embrace a certain lack of control, online activities around the State of the Union address were held based on the terms set by the White House communications team. They responded to critical voices but were selective in their engagement. Social media usage in the public sector will continue to grow as more government organizations are gaining experience in sharing information and listening to citizens through the use of digital technology. As exciting as it is too see what’s possible today, it is important to keep in mind that behind the public layer of social media engagement, there needs to be change to the internal “state of mind,” so that social media is embedded into the organization, and not simply an add-on. Getting there is a step by step process with a considerable investment in time and resources, including people and platforms, so that the organization can develop the confidence required to embrace change. The White House already has years of experience in social media implementation and integration. The execution of the State of the Union address was just the latest visible iteration of this evolution.